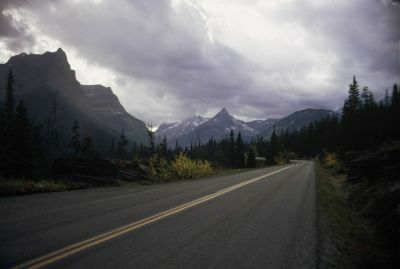 Known to Native Americans as the "Shining Mountains" and the "Backbone of the World", Glacier National Park preserves more than a million acres of forests, alpine meadows, lakes, rugged peaks and glacial-carved valleys in the Northern Rocky Mountains. The park is named for its prominent glacier-carved terrain and remnant glaciers descended from the ice ages of 10,000 years past. Bedrock and deposited materials exposed by receding glaciers tell a story of ancient seas, geologic faults and uplifting, and the appearance of giant slabs of the earth's ancient crust overlaying younger strata. The result of these combined forces is some of the most spectacular scenery on the planet.